Thanks to Buddha Pants for sponsoring today’s post. I’m pretty excited to be sharing this post. As a stay at home mama, I’ve had to be pretty resourceful when it comes to free things to do. Now that Summer is in the past and Autumn is in full swing, we are spending a ton of time outdoors again. I just feel better when I get outside and breathe fresh air. 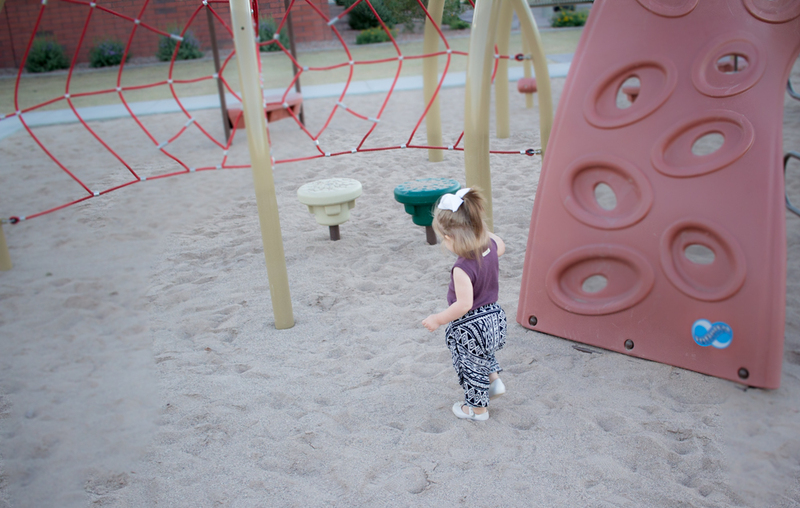 Here are five things that I do almost weekly to get out of the house with my (almost) toddler. Also keep reading below for a review of these amazing mommy and me matching pants that G and I are wearing for these photos. I am actually wearing them right now and never want to take them off! 1. Feed the ducks some oats at a local pond. This is our go-to activity right now, mostly because it’s two-fold. First I babywear while I take G on a walk around the pond. She is super into all things nature, so we talk about our surroundings. I’ve noticed kids can get bored with constant silence, so I try to talk about the mundane things I see that are actually really exciting for her. haha. 2. Check your local town calendar for movie nights, toddler craft days, etc. This is such a big one, I feel like – I never knew things like this existed before becoming a mom. My mama friends and I are always scouring our town’s calendars for activities. We’ve done Movies in the Park where they show a movie one afternoon or evening on a big screen in the grass! There are also free craft activity days too, so check your town’s calendar, and maybe even the ones surrounding you. If you live in a giant city you are bound to have tons of free options! 3. Play with your kids at a local park/playground. Okay, I know what you’re thinking… “Wow, a park, what an innovative idea” but honestly this one is underrated. I feel like we all spend time at parks, but have you ever played the “lava monster” game with your five year old? It will make you feel like a child again, in a good way. All of your worries will melt off. My kindergarten teacher side is coming out a bit, but when I used to teach my students would beg me to play with them. When I finally would give in, it would seriously make them so happy to see me running around the playground playing ‘tag’ or ‘freeze monster’ because it made me more relatable and likable. You don’t have to do it all the time, but it’s honestly the best feeling and you’ll be surprised how good you feel if you do try it out. Tip: Bring special toys that are only “park toys” to the park. If you are a parent you’ve probably already figured this one out, but rotation is sacred. Keeping the same toys in the living room, playroom, car, or using the same ones at the park can be a curse! It’s important to keep a rotation going so that you keep your kiddos guessing! If you always play with a ball or scooter at the park, eventually your kids will get bored with them. Try to switch up your supplies each time you go and it will make for a better experience! 4. Have a picnic outside and bring books to have a special readathon. *She is blowing kisses in these photos haha! G and I are wearing our matching Buddha Pants in these photos! I wear them to do yoga in the mornings and evenings (I’m such a beginner, but learning more every day) but I also wear them out! 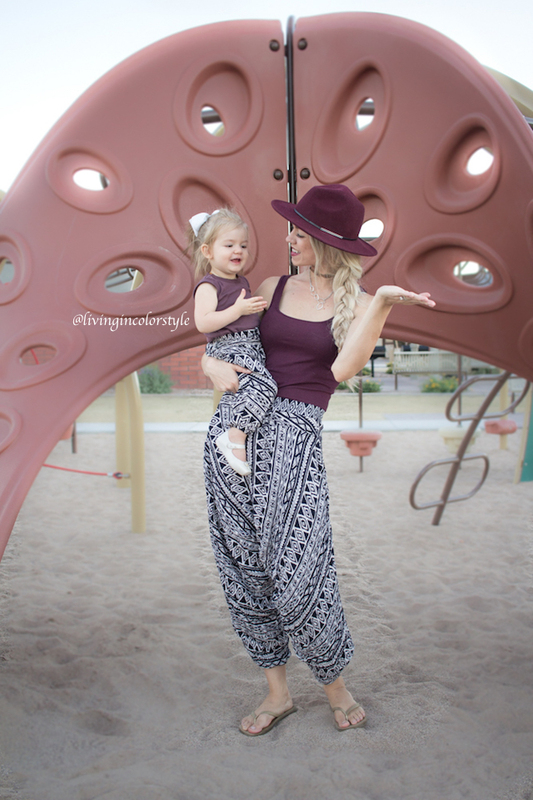 These harem pants are SO comfortable, stylish and why on earth would I turn down a chance to match with my little one?! I wore them sort of folded up, but you can also pull them down for a different look. They are 100% cotton and come in several colors and patterns! Honestly, chasing around my little toddler is hard enough – I need to be comfortable while doing so! 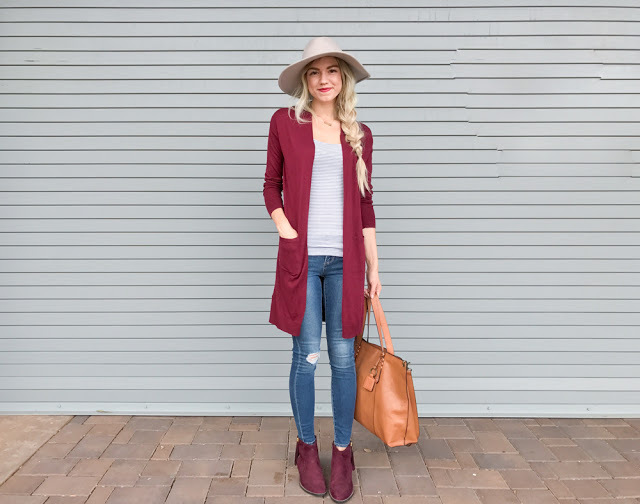 I love that these pants are super easy to take along with you too! They actually fold into the pocket and it turns into a little bag to hold them! I am going to get a pair to put in my diaper bag since they are so easy to store. You can never have too many back up outfits with kids, right? Awww, love your matching outfits, you're both looking so adorable! Aww cutest post! I love both outfits! Loving all those ideas! Pretty much the cutest matching outfits ever! Those pants are adorable! Park days are our absolute favorite! I can't get over how cute you and your daughter are! Love the matching outfits. I'm wearing similar pants as we speak! love it! oh my!!! how adorable are you and your daughter! loving those fun pants!! looks so cute! You both looks adorable and what fun activities! Aw you two are the cutest! I love that you both match! Super cute pants babe! Great ideas to do with your kiddos!! Love the matching outfits!! You both look amazing!! I love this post!! You two are absolutely adorable! This is so cute, you look like you're having a lot of fun there! How fun are those pants! Love the pattern, so cute you two! I love that you guys match!!! so cute. I just loved the post. those pants look SUPER comfy!! I love these ideas! And those pants look SO comfy and perfect for running around all day with the kiddos! aw I love your matching outfits! Those pants look so comfy too! Love the tips! I need to do the toy rotation because my little guy gets so bored so easily lol! Those pants look great on you and your little girl! You & your mini me are so cute! I'm always looking for great things to do with the babies!! Such a great post! 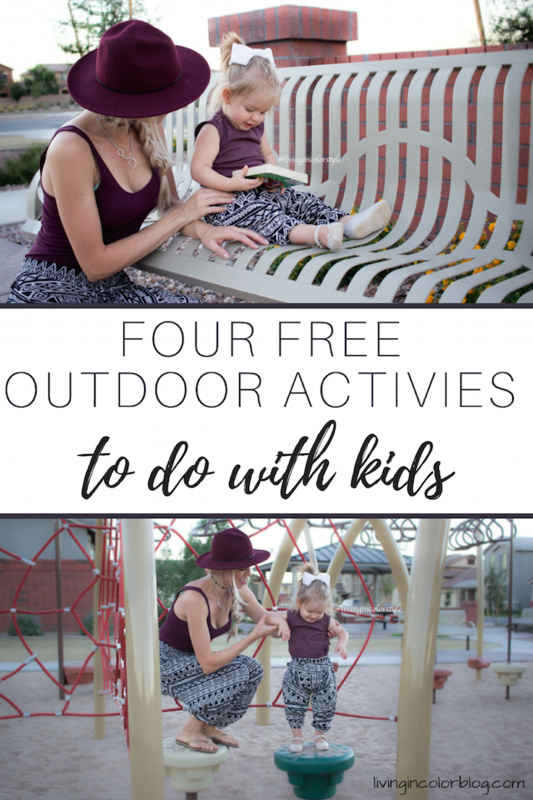 These are such great tips, I'll have to share these ideas with my friends who have kiddos! I love that you guys are matching! Great tips- def good for those with kids in tow! Those pants look so comfy! And I love how they match your little one's too! Thanks for the great tips! You're matching looks are just too cute! And you look beautiful in that wine color! You two are the cutest! Those pants look soooo comfy!